Pensacola High School students Samir Boussarhane and Falen McClellan were not satisfied with volunteering at a local animal shelter or hospital to meet their school’s requirement for public service as part of an International Baccalaureate Degree program (IBD). They wanted more of a challenge. Falen McClellan and Samir Boussarhane founded the Pensacola Debt Sharks. 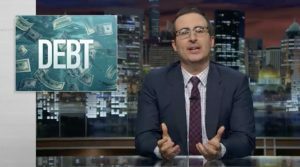 Motivated by a Last Week Tonight with John Oliver show, in which the host purchased and abolished almost $15 million in medical debt, the pair last fall decided to emulate his efforts in the Pensacola/Mobile area. Their goal: raise enough money to buy and abolish $3 million in medical debt in their section of Florida and Alabama. Not so easy, as this would require raising some $30,000 in donations. On reflection they settled at raising $10,000 to abolish $1 million in this debt. That’s a lot of cookie sales and pizza parlor shared revenue to bring in. Undaunted, they named themselves the Pensacola Debt Sharks and launched a Facebook page and set about addressing the task. By summer, they found themselves less than halfway to the goal. …from an anonymous southern Florida donor who – having had the past experience of seeing two of his own children participate in a southern Florida high school IBD program – understood that a little help from the sidelines can always prove helpful. The mystery donor arranged with RIP to see that his family’s contribution of $25,000 would be applied directly to the Debt Shark campaign. This means that roughly $2.5 million in medical debt is now taken care of – twice the amount that the Sharks were looking to abolish – which leaves only $3-5,000 needed to be raised should they want to return to their original goal of three million dollars in medical debt relief. They were delighted. This week they will be fundraising at Saturday Game Night held at the school library where they will ply fellow students with pizza gifted from a local pizzeria and ask for donations and fundraising help. Laura Brewer, the school’s IBD Director, was very enthusiastic about their success. Exactly 555 students, ranging from 9th grade through the 12th grade, are involved in the demanding program. One of the key guidelines around selecting a community service section: pursue a project you are passionate about. RIP’s CEO, Craig Antico, who green-lighted the project last year on RIP Medical Debt’s side, was initially surprised to get a call from the students asking permission to raise money to have RIP abolish it. Because of this positive experience, RIP assigned their summer intern, Harrison Schlossberg, (editor of RIP’s Facebook page and now a High School senior himself), to design a “template” that students at other high schools or colleges could follow if they wish to create a similar program in their town or city.